Posted on- October 1, 2017 at 8:45 P.M.
Have you ever heard of a small town in upstate New York by the name of Canastota? Perhaps you live there, or near by, or went to see the Boxing Hall Of Fame, or just made a quick pit stop off the New York State Thruway once, perhaps you fall into one or more of these categories, but chances are you have no idea about this small little town that I grew up around & have a lot of fond memories of. I myself even attended school in Canastota for a short time. Canastota is a quaint little town filled with a rich history, great people, & a decent variety of different things to do. Canastota has some of my favorite places to eat, great places to shop, great places to hang out, & all around just a lot to do. Although for such a quaint little peaceful town, Canastota sure has a lot going on & Canastota's politics is no different. As I live near by, the future path of Canastota is important to me with a lot of debate on issues like whether or not to put in roundabouts to improve the flow of traffic & help to reduce accidents, or to change the speed limit on the road & try to achieve the same safety goal in a cheaper more cost effective way (An Issue Brought Up To Me By Blanchard). With so much going on in Canastota I am interested in finding the most Progressive minded individuals who are principled & hold true to their values. That is where Douglas Scott Blanchard comes in. Blanchard is a teacher by trade & is working on a Master's in literacy, Blanchard believes it will help make him a better English teacher as well as give him some background he can use if he ever decides to try being a principal somewhere down the line. Although Blanchard is currently running for a town council seat to help better the lives of the people in Canastota. I Luckily got the opportunity to interview Blanchard, & despite the fact that it takes a lot to impress me, & I also did have slight disagreements with him at times, I was overall impressed with Blanchard's answers & his positions on the issues. I asked questions that ranged from where he stands on national issues to what he is looking to accomplish on the local level. 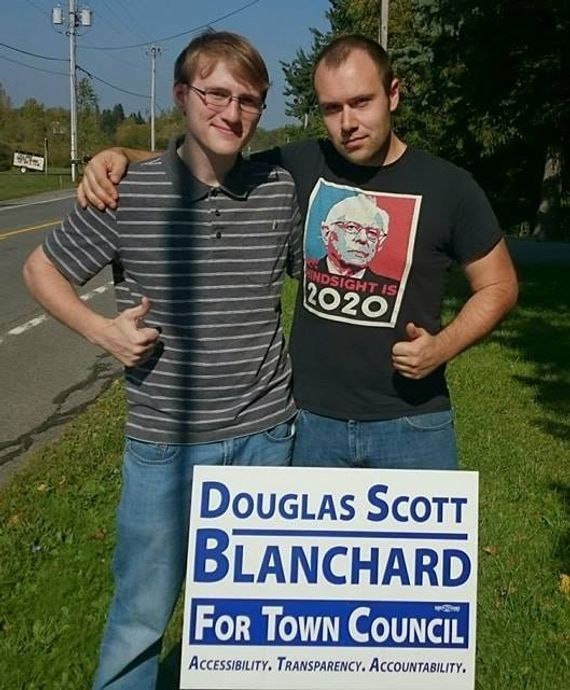 When I first got in touch with Blanchard & asked him about the interview, Blanchard told me he looked into me & the Josh Hill Politics website, Blanchard then voiced how he found it refreshing to meet another Bernie Sanders supporter in our area (Which Is Considered A Heavily Right Wing Area). I actually really liked our first interaction because the topic related to my first question. I told him it was funny that he mentioned Bernie, because my first question was, "Did you support anyone in the Democratic Primary, & if so, who?" But he had already answered without beating around the bush, I liked his straight to the point honesty. So I decided to follow up on that issues in a bit, for now I decided to also ask a more local based questions. So I asked, "Why do you feel the need to run for town council? & what are your goals if elected? Also how would you differentiate yourself from other politicians?" Blanchard's replied by stating, "My college roommate was a big Hillary supporter, so it was a little tense during debate nights, haha. I think he'll be supporting Bernie if he runs in 2020, though, after how the election went. I feel like a lot of people feel, disconnected from their Government, even at the local level, & that's a tragedy in & of itself. I want to work hard to make our local Government more accessible, transparent, & accountable. I think it shouldn't just be possible, but easy to be heard by our local representatives in a variety of mediums. I think people deserve to know what steps are being taken to enact the projects they want done with their tax dollars &, if there's a stumbling block, they deserve to know what or who is preventing progress from being made & who they can call or write to help get things moving. I think that a lot of the time, politicians don't want to have the hard conversations, but you can bet you'll hear back about their successes, especially in an election year; representatives need to face up to their constituents & keep things transparent, even when it's hard. My commitment to these three principals is what I offer as a candidate: accessibility, transparency, & accountability." I found Blanchard's views on how to give back more power to the citizens of Canastota, & hold the individuals in office accountable as very positive positions. Although I admit I was still curious about his stance on national politics & the specific policy positions he supports. I went on to ask, "As a Bernie Sanders supporter, which of Sander's policies do you support? Medicare for all Single Payer Health Care? 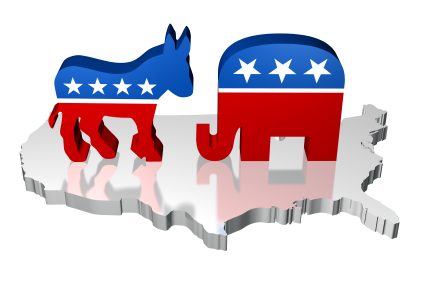 Comprehensive campaign Finance reform? A living wage? Tuition-free public college & universities? Paid time off? Combating climate change? Getting rid of the death penalty? Ending the wars? Legalization of marijuana? Etc... Etc...? As it turns out, Blanchard actually vehemently supports a long list of strong Left Wing Progressive policies, Blanchard answered by saying, "I strongly support Single-Payer Healthcare, Tuition-Free Public College (& Especially Trade Schools! ), a Living Wage (Among Other Benefits Traditionally Championed By The Unions)... Really, there's not a thing Bernie espoused that didn't resonate with me on some level. As a Town Councilperson, of course the scope of my ability to impact those issues would be limited, but as Bernie has told us, getting young, Progressive-minded people in local office is the first, biggest step we can take to transforming this country." Blanchard is correct, as a Town Council person, the scope his ability to impact those issues would be greatly limited. So I followed up & asked, "What exactly are looking to get done in the community with the office you are running for if you win? & I agree that more Progressive minded young people should be running for office. So another question I had was, what do you think of the Justice Democrats? Also what do you think of third parties? Blanchard answered saying,"My biggest goals are, like I said, to focus on bringing accessibility, transparency, & accountability to our local Government. There's no partisan way to fill a pothole (So To Speak), but I can bring my work ethic to help better serve our constituents as a representative. I want to make myself available in a variety of mediums to make it easy for anyone to contact me, whether that be by email, phone, online form, the farmer's market, personal meetings, or whatever it takes to help people be heard. I want to make it clear what steps I'm taking to address issues brought to me by updating an online log of my progress & following up with those constituents that brought up the issues to me. Like I said before, that also means not dodging the hard conversations, holding myself & the rest of our Government accountable, & facing up to what I can do, can't do, & will do as town council. When I win, I want to make sure our local Government is doing as much as it can to really represent the people paying taxes to make their town a great place to live. I'm a fan of the ideas in the Justice Democrats platform; I also think that we should abolish the "first past the post" electoral system & modify the system to give Third Parties a fair chance, maybe with a Ranked Choice Ballot or something similar. However, I think to achieve either of these goals, we need to flood the Democratic party with a Progressive voting block that wants these changes. Ultimately, that means that to make Progressive national changes, we need to start with local Democratic candidates that will grow to be the larger representatives we want today. Grow to be the representatives & voters we want today, that is! After all, there are a lot of ways folks can engage with the political process without running. At this point I figured I had gotten a well nuanced interview with some really good answers from an individual looking to help the lives of his fellow citizens. Although I still had just one more question, leading me to ask a questions that would help me fully understand his position on my biggest issue that I hold, which of course is about money in politics. Campaign Finance Reform is arguably the most important issue because it affects all other issues I personally voted for & endorsed Bernie Sanders in the primary, & when the DNC & Hillary Clinton rigged the Democratic primary against Bernie Sanders & cheated him out of the nomination, I for the first time of my life voted for a third party candidate for President of the United States. With this information given I then asked Blanchard, "Who did you vote for in the general election & why?" Blanchard's replied with, "I agree that Campaign Finance Reform is a big issue that needs to be addressed. For my part, I've only taken donations from individuals (in $5, $10, $15, or $27 preset amounts, although I've had a few exceptionally generous friends who donated an astounding $100). I included the $27 option because I think the transparency & integrity of Bernie's campaign fundraising was part of what made him such a powerful, inspiring figure for so many. In the general, I ultimately voted for Johnson & then down-ticket Democrat. Partially it was because of my distaste after the Democratic primary, but a large part of it was the arithmetic of the election. Because we have the Electoral College, I knew very well where New York was going to vote; my voting for Clinton wouldn't have helped her here. However, I felt my vote could help third parties get a seat at the table during debates & the like &, perhaps, help shift the discussion towards abolishing "first past the post" altogether. If I lived in a red or a swing state, I would not have had that same luxury; it's frustrating to think how many folks aren't free to vote their conscience. That's another reason why Progressives have got to start running for local office now. The only way we can hope to see more Progressives on the ballot that we can wholeheartedly support is if we put them there ourselves. That answer genuinely threw me for a loop, I would expect an honest principled Left Wing Progressive to say he or she voted Third Party, but I wasn't expecting that the Third Party Blanchard voted for was the Libertarian Party over the Green Party. With Blanchard's answer I knew I could not yet end the interview without a follow up question to get a more clear answer, because that last answer just simply took me by surprise. So I replied, "You were voting for a third party candidate due to the fact that you wanted to support third parties, & this makes sense knowing that a vote for one of the two major party candidates in New York is irrelevant due to the Electoral College. Although why did you cast your vote for Gary Johnson over Jill Stein? Jill Stein's policies aligned almost entirely with Bernie Sanders (& Is Even A Bit More Progressive), while Gary Johnson (Among Other Things) was in favor of money in politics, & even supported the Trans Pacific Partnership." Blanchard answered, "I disagree with both Johnson & Stein on a number of issues, but I think it's important to remember that neither of them was going to win in 2016. Ultimately I was hopeful that one of them would meet the 15% threshold as set by the Commission on Presidential Debates, but I knew that it would be a difficult hill to climb. In this case, I looked at the two popular third party candidates & I tried to evaluate who had a better chance of getting to 15% because if one did, certainly the other wouldn't, & any third party candidate getting to 15% would be a big step, I felt, towards helping third parties in general. At the time, I felt Johnson would outperform Stein based on what I was hearing (Which He Did In New York, Albeit Not By Much), although I had a friend who was a big advocate for Johnson, so perhaps that swayed my perception of his popularity last year, haha. Also Jill Stein wasn't on the ballot in a lot of states, & as I said, voting Third Party was a luxury that year because of the state I lived in; because I felt New York's electoral votes were decided, I was able to use my presidential vote as a referendum on issues like the Electoral College, first past the post voting, & so on instead of on the candidates themselves. I voted based on the information I had at the time; if I thought it would have helped defeat Trump because New York's electoral votes were in jeopardy, I would have had to vote for Clinton. I hope that helps clarify my reasoning that year." I still wasn't entirely satisfied with Blanchard's follow up answer, & so I did one last follow up question. I pointed out, "While it is true that both Jill Stein & Gary Johnson were Third Party candidates disenfranchised by a broken two party system, I'm just curious why you chose to support Gary Johnson & the Libertarian Party over Jill Stein & the Green Party? The 5% & 15% rules only helps the specific party that reaches that percentage, it doesn't actually help both Third Parties. Without something like Ranked-Choice Voting there will only ever be two predominant parties at a time. For example when the Republican Party first came into existence as a Third Party it accumulated enough popularity to replace the Whig party. Isn't voting for one Third Party candidate like Gary Johnson over another Third Party candidate like Jill Stein simply because one has a better chance at success in reaching 5% & 15% just a similar scaled down version of supporting the lesser of two evils in a way? Also let me clarify, when I say the lesser of two evils on a smaller scale, I'm not saying that Gary Johnson is the Lesser evil of Jill Stein. I'm simply using the comparison of the "better chance of winning" part of the lesser of two evils argument that a lot of people make. So my ultimate question is what specific policies of Gary Johnson & the Libertarian party do you support over Jill Stein & the Green Party? What specific policies lead you to support one over the other? Blanchard surprisingly had a better answer than I was expecting. Although I still wouldn't have went in the same direction myself, I must admit the answer I got was an answer with genuine disagreements that Blanchard had with both of the third Third Party candidates. Blanchard answered saying, "It's funny that you made that comparison; even when we fight against first past the post, it still influences us. While it's true that the Libertarian Party reaching the benchmark wouldn't secure the systemic benefits for other Third Parties, like the Green party, I did feel that if one Third Party reached it, it could raise awareness about the state of our electoral system & perhaps spark more debate on systems like Ranked Choice Voting. That was why I voted based on the odds. If I were to reflect on their policy positions, as I said, there are a lot of positions they both hold that I don't agree with. That's why I was ultimately a Bernie supporter in the primary season. For example, I wish Johnson were better on the Environment & Healthcare while I wish Stein was less critical of Nuclear Energy. If I had the deciding vote between the two of them, Stein definitely aligns more with my political ideology on many issues. However, while I disagree with some of their policy positions, I strongly believe they should have the right to voice them in a public forum & that the voters should have the opportunity to hear them out. That's why I voted third party. I was thankful I lived in a blue state so that I could vote my conscience, although as you said, even when I was voting Third Party, the shadow of the defacto two-party U.S. electoral system still influenced my decision." I found this answer better than I was expecting because I admit I was expecting to hear some common used lines of propaganda against Jill Stein about Wifi or Vaccinations, but in the end Blanchard was well informed on the issues & just seemed to have genuine disagreements on a few policy positions with each Third party candidate & thought he was doing the most effective thing to help Third Parties, but in the end Blanchard wants to help Left Wing Liberal & Progressive ideas become reality, & it is because of this & his drive to want to help his fellow citizens that he has been officially endorsed by Josh Hill Politics (JHP). Although I can't end this without mentioning Blanchard made the caveat that donations would be helpful, but what would be "even more helpful than monetary contributions would be time. Any time you can spare to contact folks in Lenox, whether by phone calls, canvassing, or just mentioning me in line at the supermarket would be an enormous help. I'm humbled by all the support I've had so far; my friends & family have come together to help get my campaign off the ground & I couldn't have done it without each & every one of them. When we work together, I've seen that we can accomplish great things, & I can't wait to see what that translates to in November."